Thinking of the perfect marriage proposal to sweep a girl off her feet might seem like one of the most daunting tasks that a man will ever have to face. This needn't be the case, as these 22 guys will show you. Sometimes, it's no more difficult than knowing where her interests and hobbies lie. This girl was clearly a Disney fan, as her boyfriend proved by going to the length of meticulously recreating the living room scene from popular Disney hit “Up”, complete with multi-colored balloons and vintage furnishings. The only thing better than a stunning, hand- crafted engagement ring in a presentation box is one encased in milk chocolate. After all, what girl doesn't love chocolate? This man went one step further, including a personalized proposal message in place of the traditional instructional materials. Chris and Courtney spent their fourth anniversary in Disneyland, and to make it even more magical, they dressed as Cinderella and Prince Charming.Dressed like a Disney princess in Disneyland, Courtney probably thought that she couldn't feel any more like a princess.That is, until her groom's brother in law arrived and presented her with a glass slipper, also bearing the ring. Chris popped the question as both of their families appeared to show their support. 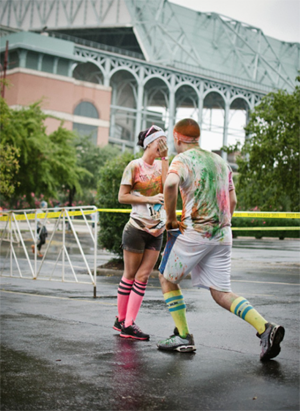 Katelyn was likely expecting nothing more than to be tired and aching after a 5K color run. 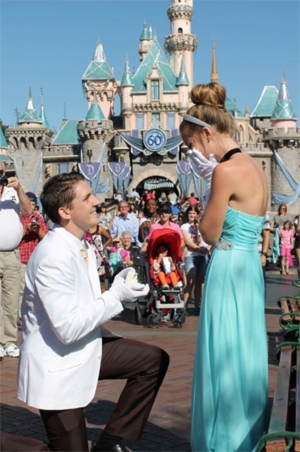 What she got was a very public proposal and future husband-to-be. What we really love about this proposal is that the bride said herself that she'd never had an idea of how she wanted her proposal to be, which just shows that even the most unexpected of ideas can be the most perfect. As part of a cruise ship holiday, Jessica had the chance to swim with dolphins, who were trained to bring their visitors a rock for good luck. Little did Jessica know that the kind of rock she'd be brought was a very expensive one that you wear on your finger. We'd say that her groom had all of the luck he needed that day. Some grooms get permission from their bride's father, before popping the question. This groom went one better and got the permission of her bride's sick dog, with whom she had grown up. but he created a memory of the two together that would last forever, and most importantly, she said yes. 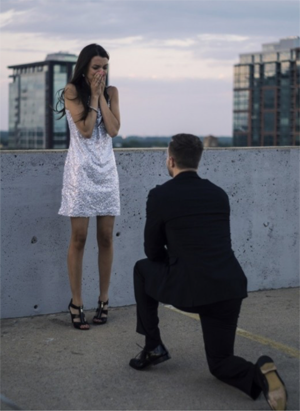 A great deal of planning went into this proposal, when the groom-to-be dropped onto one knee in front of a crowd of 7,000 people. 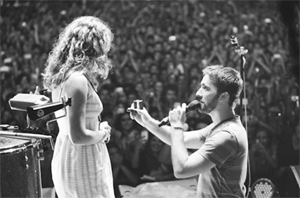 special event, and proposed in front of an enormous crowd, on-stage. 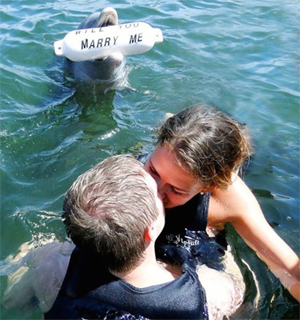 Though this kind of proposal is not for the faint-hearted, you can be sure she'll remember something like this forever. Just make sure she's not scared of crowds! Some of the greatest love stories come from epic literature, something that this groom clearly understood. Rehearsing in secret with his bride's family, he donned vintage clothing to create a real Mr Darcy and meticulously acted out a 30 minute performance, using scenes taken straight from the novel. Fate and a new city job in Chicago brought these two together, and the groom sealed the deal with his thoughtful proposal at the Lincoln City Zoo during a lights show. 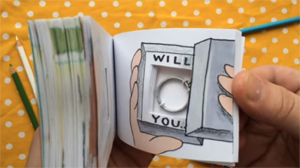 If you have a special talent, why not turn it into an incredible proposal like Rodney did when he hand-crafted a flip book containing his marriage proposal. 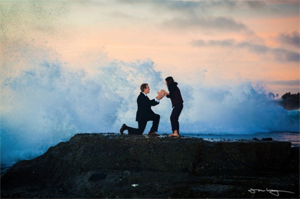 Here's another example of putting artistic flair to good use in creating a stunning proposal. This is proof that you don't need a grand setting to ensure a memorable day. 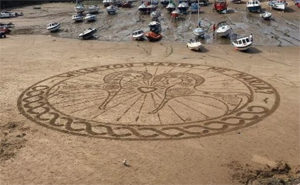 With the backdrop of a picturesque harbor in Southern England, this groom declared his love for his bride in the sand. Sometimes, you can only plan for so much and the rest just comes together when you're in the moment. 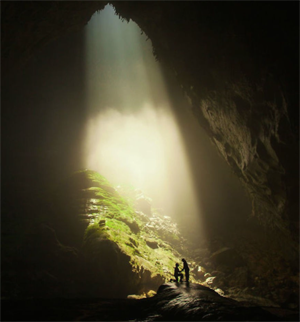 Jarryd was on an expedition with his bride-to-be, exploring Vietnam, when he came across this stunning, sun-drenched spot in the middle of the world's largest cave. When asked by the girl how he wanted to pose for the photo, Jarryd dropped to one knee and presented her with a stunning engagement ring. 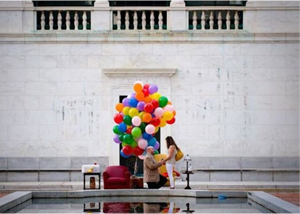 We love this creative proposal, especially given that the bride was so close to it without a clue what was happening! 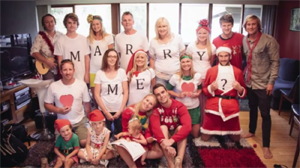 Intended to be a Christmas family photo with her nearest and dearest, she had no idea that they'd shuffle the message up at the last minute, creating that all important question. When she checked the photo on the camera, her groom was waiting behind her on one knee. stop holiday, visiting different cities with her future groom. 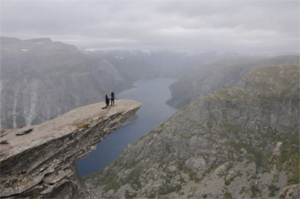 Her patient wait paid off when he dropped to one knee at the end of a rocky outcrop in Norway, some 2,000 foot above ground. made sure that you don't lose your ring in the ocean! 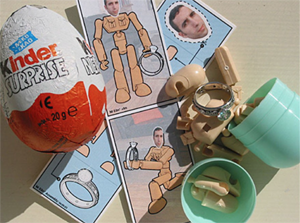 This groom thought of a foolproof way of immortalizing his proposal in a photo for years to come. It involved meticulous planning, a little help from some friends, and Splash Mountain. The bride was non-the-wiser until, with the signs carefully concealed until the photo flashed up on a screen at the end of the ride. She said yes, and of course the purchased the picture. 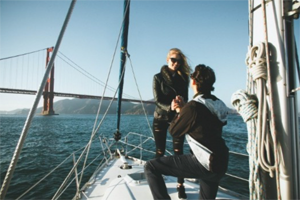 This proposal took place out on the open water, on the bow of a boat. The area meant a great deal to the bride, as it was the site where a loved ones ashes had been scattered in the past. When he asked her onto the bow of the boat, she thought he just wanted to recreate some Titanic pictures, but ended up with a love story of her own. Seth roped in his brother, a special effects artist, to build a proposal centered around an action movie, with the ending being him dropping onto one knee. She had suspected that a proposal might be coming, as they were due to jet off together on holiday. However, we bet she wasn't expecting to star in a movie. Still, she got to be the star of the show and got to marry her perfect guy. Kasia always told her groom that she wished they took more photos together. 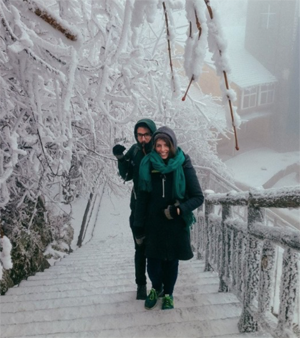 She got her wish when accompanying Nick to China on one of his work trips. The pair took many photos together. What Kasia didn't know is that in the background of over 50 photos, Nick was holding up a sign that said 'Marry Me'! 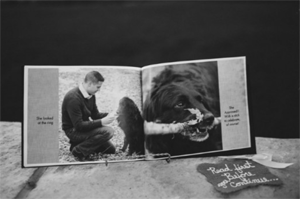 It wasn't until they returned home and were stood at the end of a pier overlooking the city, that Nick presented his bride with a special book, filled with the proposal pictures, and popped the question. This groom proved that an at- home proposal doesn't have to be any less romantic than any other proposal. He filled the room with photos of them both as a couple, trinkets they had collected during their time together, and gifts that they had exchanged. was overjoyed and said Yes. These two started their engagement on top of the world. The groom popped the question in a hot air balloon, with the couple's song playing in the background. 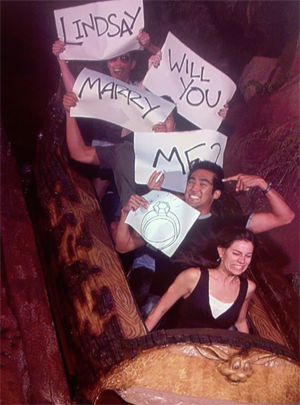 Her only request had been that the proposal be a surprise. What's more, as the couple had already been talking about marriage, the bride had pre-emotively ordered her dream wedding shoes in advance. 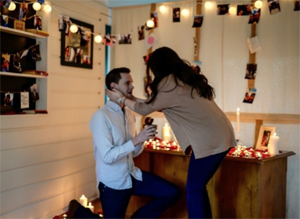 Imagine her surprise when the shoes were turned into the proposal! If you have a specific talent, why not work it into the proposal? 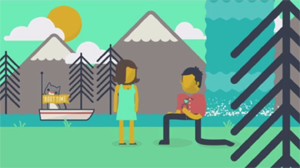 That's what Adam did when he used his programming and design experience to create an animated proposal, charting their journey together from the day that they met, and presenting it to her in a beautiful spot in their city. Sam and Leanne had known each other since they were around eleven years old, so it was only fitting for the proposal to be the ultimate end to a hand-crafted board game, which chartered their lives and relationship since meeting. 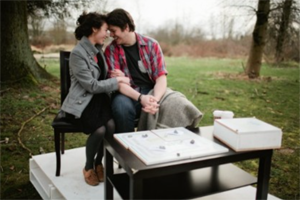 A talented writer and photographer, Sam built the board game himself, which saw him pop the question at the very end, once the couple had played through together.